Roger Stone mocked the death of former first lady Barbara Bush on Instagram after a new book chronicled her criticism of the current president, USA Today reports. President Trump told the Washington Times that he understands why Barbara Bush was so critical of him, because he was so hard on her sons. According to a USA Today excerpt of The Matriach by Susan Page, a friend gave Barbara Bush a small plastic clock that counted down the number of days, hours and minutes until the end of Donald Trump’s term in 2021. It was on her bedside the day she died. — Barbara Bush, quoted by USA Today, when asked in October 2017 whether she still considered herself a Republican. “A chummy discussion between Vice President Pence and former vice president Richard B. Cheney quickly turned into a vigorous back-and-forth over President Trump’s foreign policy at a private gathering Saturday, with Cheney comparing the president’s instincts to those of his Democratic predecessor Barack Obama,” according to a transcript obtained by the Washington Post. — Former President George W. Bush, quoted by the Washington Post, delivering the eulogy at his father’s funeral. “President Trump traversed a wide political chasm Tuesday evening when he personally welcomed George W. Bush, his occasional foil, to Blair House, the presidential guest quarters across Pennsylvania Avenue from the White House,” the Washington Post reports. “President Trump will attend but not speak at this week’s funeral service for former President George Bush, seemingly a compromise intended to respect tradition while avoiding an awkward moment given the animosity between the current president and the Bush family,” the New York Times reports. If you want to know more about our 41st president, you should read What it Takes: The Way of the White House by Richard Ben Cramer. It’s a story of the 1988 presidential campaign and also one of the best political books ever written. President Trump, who had a hostile relationship with the last Republican family to occupy the White House, offered nothing but praise for former President George Bush just hours after the 41st commander in chief died at age 94, the New York Times reports. — Mikhail Gorbachev, the last Soviet leader, quoted by Reuters. “George H.W. Bush, the 41st president of the United States and the father of the 43rd, was a steadfast force on the international stage for decades, from his stint as an envoy to Beijing to his eight years as vice president and his one term as commander in chief from 1989 to 1993,” the Washington Post reports. 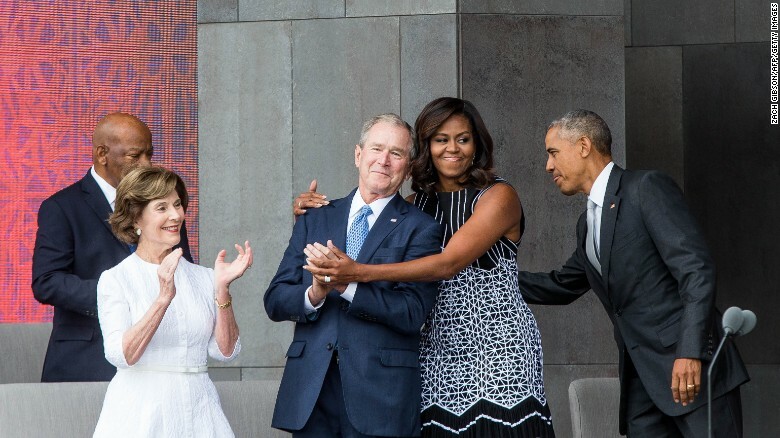 BUSH: He said, ‘Send her my love.’ And I thought, you know, it’s so interesting how people are so interested in y’all’s friendship. I mean that hug was, like, the hug that went around the world. I do love that picture. OBAMA: That’s your dad. That’s, you — you know your dad. You know? BUSH: Why do you think people are so hungry for that, though? OBAMA: Because I think the political discourse, the way it’s shown in the media, is– it’s all the nasty parts of it. You know? Because I guess we’ve become a culture where the nasty sells. So people are just gonna keep feeding that. But the truth is much more complicated and complex than that. And I’d love if we as a country could get back to the place where we didn’t demonize people who disagreed with us. Because that’s essentially the difference between Republicans and Democrats. We’re all Americans. We all care about our family and our kids, and we’re trying to get ahead. We have different ideas about what’s the best way to get there. You know? But that doesn’t make me evil. And that doesn’t make him, you know, stupid. OBAMA: It’s just a disagreement and that’s how I feel about your father. You know? He’s a beautiful, funny, kind, sweet man and I don’t know that I agree with him on everything.